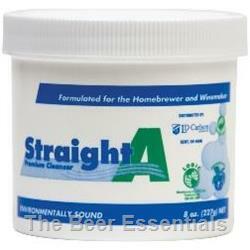 Removes beer stone (hardened yeast) and other fermentation residues. Needs thorough rinsing. The active oxygen cleans without chlorine or bisulfite. Especially useful in cleaning hard-to-reach areas, like carboy necks. Environmentally friendly.